First I would like to start by emphasising that whichever option you choose no repair is new again. The factory finish only happens once and it is disappointing to have to repair any vehicles paintwork. Having said that, both Mobile Repairers and Crash Shops provide outstanding finishes. Let’s talk Mobile Repair vs Crash Shop. Why are we so much cheaper? Well that’s easy. 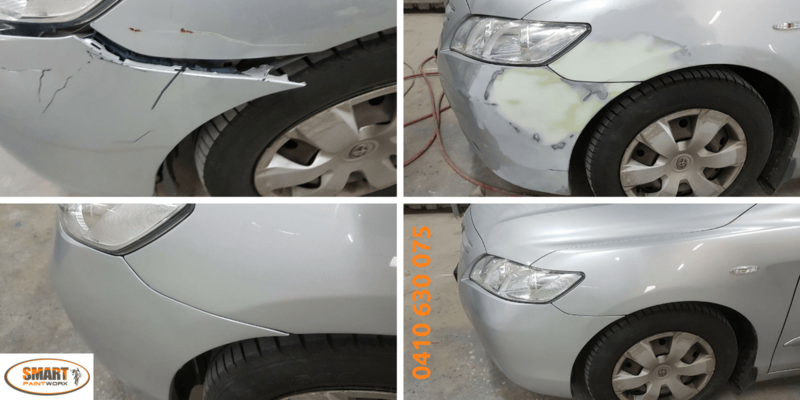 Using the technique known as S.M.A.R.T repair we keep the area of damage small rather than respraying full panels. We also don’t have the same overheads so we can pass this saving on to you. Will the colour match? Absolutely. Like the crash shops we have a computer program that is updated regularly listing all the recipes for each and every colour for every make and model. Ours is a little different in that we obviously needs much less of the paint mixed each time so the recipe is adjusted accordingly. How can we repair at homes and workplaces? While Crash Shops paint full panels they need ovens to bake off/cure the freshly painted panels. For us mobile repairers that keep the area small we can use Infrared lamps that will achieve the same outcome. Will you notice the repair? Well I certainly hope not!! While some colours such as silver cannot be painted to the edge without it being noticeable there are ways around this. By simply blending on to the next panel slightly it will conceal any start and finish points. Will it be like new again? We can kid ourselves but once any repair is done nothing is ever new again but we do endeavour to achieve as close to the new as possible. How can it be done so quickly? Again this is just simply because we choose S.M.A.R.T (Small, Medium, Area, Repair, Technique) and keep it small. Less preparation, less painting and less polishing. As we only specialise in small repairs there are still many repairs that can only be repaired at a Crash Shop. While we have many returning customers we also have new customers calling regularly. Crash Shops have been around for a long time and sometimes it’s hard to take the leap but I assure you once you do you’ll wonder why you didn’t sooner. Many customers are astounded by the finish. Mobile Repair vs Crash Shop, which will you choose next time? This entry was posted in Mobile Repair vs Crash Shop and tagged dent repairs, scratch. Bookmark the permalink.